With a profound respect for the rich and diverse environments that we visit, our guided trips combine great people, great food and great places. Your Fluid experience will include a focus on skill acquisition, the natural history of the area, cultural and environmental awareness, small group sizes and a whole lot of fun and exploration!! We work with the Coiba ANAM administration for the permission to operate in this UNESCO Heritage Site. This is a shorter trip than our 6 day expedition that still enables the participant to get out to Coiba island and allows for the opportunity to explore and experience its grandeur. We will camp, snorkel, bird watch and live amongst this pristine jungle environment. Day 1 – Depart Santa Catalina early morning via boat launch and local captain. Travel 90 minutes along the Pacific Coast to Isla Coiba. Register at the ANAM Station and tour the Natural History Museum. Take a short paddle to a secluded bay to set up our base camp. Enjoy an afternoon snorkel right from our own beach with the potential to see rays, sharks, turtles and puffer fish. Our camp is often visited by capuchin monkeys, herons, kingfishers and hummingbirds. Finish the day with a tasty meal, a beach-side fire and explore the unimpeded night sky. Day 2 – After a hearty breakfast and searching for signs of visiting night life, we set out for a day of paddling. Kayak past a swamp mangrove, before stopping in to explore Mango Beach where you can beach comb for hidden treasures and visit with the Howler Monkeys, black hawks and osprey. Next stop, Isla Granito de Oro to snorkel amongst the diverse species. Finish the day with a paddle back to camp and a well deserved meal and some relaxation before exploring the dusk activity and night sky. Day 3 – After breakfast we will break camp and paddle back to ANAM station where we will have opportunity to enjoy the facilities, hike, bird or relax before heading out by boat to access one last snorkel spot that we could not access by kayak..possibly beautiful Canales Afuera! After our snorkel and lunch we then return back to Santa Catalina in time for an afternoon siesta, surf or in time to catch your bus out of town to continue on your adventures. Accommodations: Secluded bay beach camping, all meals & snacks included. 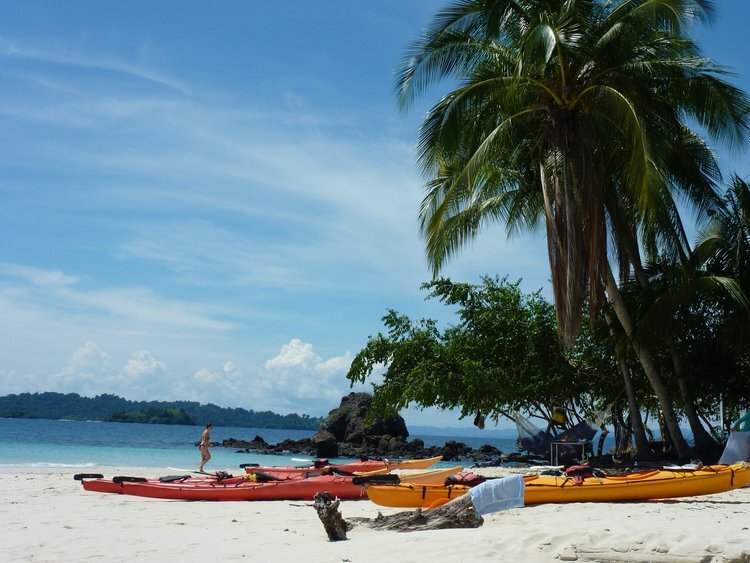 This 6 night Coiba Island Expedition allows you to experience multiple camp spots, maximum wildlife, diverse paddling, a chance to visit the Penal Colony and a beach popular with scarlet macaws! Explore by kayak secluded white sand beaches, wildlife filled bays and snorkel species-rich reefs, rocks and beaches . Your Fluid experience will focus on skill acquisition, quality food, the natural history of the area, cultural and environmental awareness, small group sizes with a whole lot of fun and exploration!! Day 1: Depart Santa Catalina early morning via boat launch and local captain. Travel approx 90 minutes along the Pacific Coast to Coiba NP. We tend to start these tours with our first 2 nights around Punta Esquina and the Bahai Damas area in order to access the penal colony and macaws. Day 2: Visit Penal colony and scarlet macaws. This is usually the day we get to paddle over to the old jail. 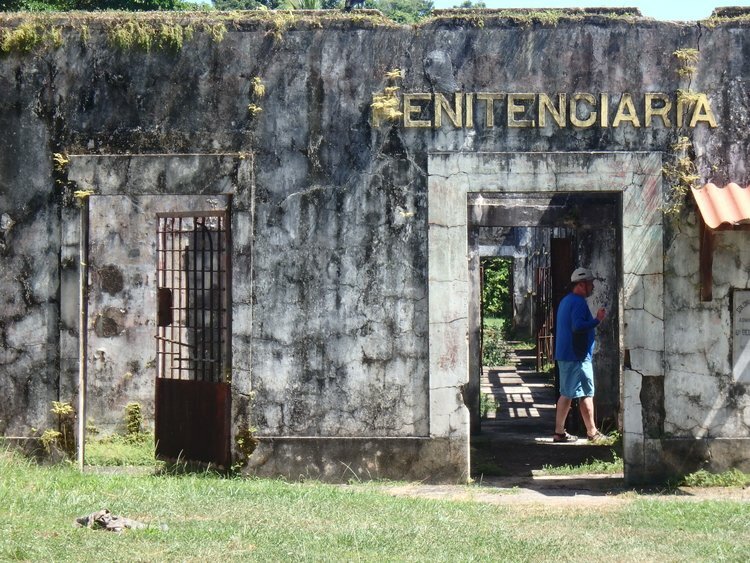 Exploring the "Alcatraz of Central America" site that operated up until 2004 brings about stories of the past where the original buildings were actually for the rangers to lock themselves in at night while the prisoners slept in more basic structures 'outside'. Once we've had our fill we can also go seek a few spots that often frequent the macaws. Day 3-5: Explore by kayak secluded beaches, wildlife filled bays and snorkel species rich reefs and rock out croppings. Opportunities to visit Isla Rancheria and learn about the Smithsonian Institute and their important studies, kayak to Granito de Oro and snorkel among the diverse species including turtles, sharks, rays and parrot fish, explore Mango beach and visit with the howler monkeys, black hawks and osprey. We'll get to paddle around the Cocos islands to view nesting shorebirds and snorkel some sweet spots. We will also work on teaching/refining proper stroke techniques and skill improvements. Our camps are often visited by capuchin monkeys, agoutis, kingfishers, honeycreepers, hummingbirds and herons, to name a few. Day 6: We break camp, paddle to the ANAM ranger station to rendezvous with our boat and local captain Kirri. We have the opportunity to visit some locations we may not have been able to reach via kayak, such as beautiful Canales Afuera! Continue back to Santa Catalina for a delicious lunch at one of the locally owned restaurants, connect with travel plans or check in to your Santa Catalina hotel to chill, reflect and reward yourself! Activities Include: Kayaking, snorkeling, camping, hiking, birding, hammock surfing, wildlife viewing, star gazing, exploring, beach combing for hidden treasures. *if you have different travel dates please contact us and we'll do our best to accommodate you. Day 1 – Depart Santa Catalina early morning via boat launch and local captain. Travel 90 minutes along the Pacific Coast to Isla Coiba. After checking in at the ANAM Station, embark on a kayak tour to secluded bays brimming with wildlife, white sand beaches, and pristine snorkeling with the opportunity to see rays, sharks, turtles and puffer fish. Return to our site for a tasty dinner and evening activities including star gazing. Day 2 – Your guide will prepare your breakfast before your activity of choice – beach combing, hiking, snorkeling, or more kayaking. 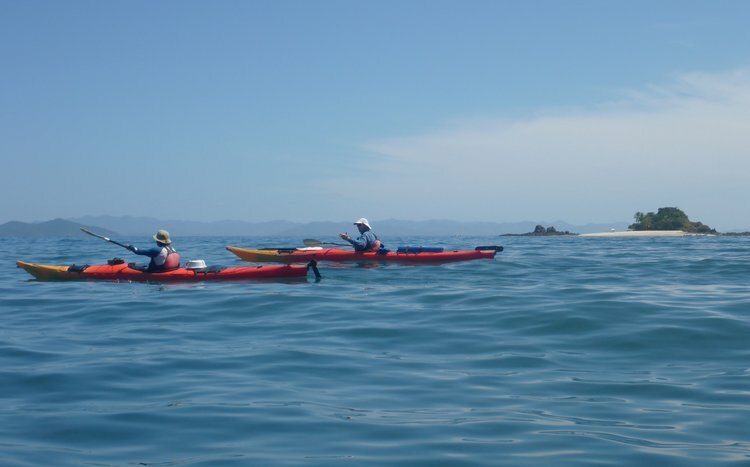 We will paddle back to the ANAM station where we rendez-vous our boat for a cruise through the beautiful park islands, a final snorkel and follow the coastline back to Santa Catalina. Accommodations: Secluded bay beach camping, all meals included. While there are choices in Santa Catalina for day trips, we pride ourselves in providing quality, safe, reliable, guided experiences with a trip tailored to your needs, wishes and desires. Choose from one of our options or let us custom an itinerary with you. This full day tour allows us to combine 2 of our loves..paddling sea kayaks and swimming with the fish. We depart Santa Catalina and travel via motorboat to Coiba. Once we reach the park we leave the boat behind and paddle via kayak to Isla Cocos or Granito de Oro or one of our favourite snorkel spots. We then paddle back to the ANAM station where we can rinse off and rendezvous with our boat. Depending on time/conditions we may be able to snorkel Canales on the return trip. This tour allows us to use the motorboat (panga) to access points of interest and unparalleled beauty. We’ll use the day to explore beaches, snorkel areas brimming in sea life (we love turtles!! ), searching for whale sharks, mantas, humpbacks, etc (when in season). We’ll also get a chance to walk one of the Coiba temperate rainforest trails in hopes of seeing capuchins, howlers and birds like capped manakins, tiger herons and black hawks. This tour takes us to a different region of the park. Equally beautiful, the day focuses more on the storied history of the park as it used to be the Alcatraz of Central America. We’ll walk around the old Penal site and contemplate the past. Once through here we’ll go to a spot that frequents the macaws..hopefully we’ll be fortunate to view. Depending on time/preferences we may be able to add in a nature walk or snorkel. *Prices for Day Trips based on a 4 person minimum. We are happy to provide ‘private’ and small group/individualized tours. Otherwise our group max is 10 people on day trips and 8 on multi-day tours.